Highlights of the second F2 race from Russia. George Russell took a massive step towards the F2 title with victory in mixed conditions in the Sprint Race in Russia. The Mercedes junior now holds a 37-point lead over Alexander Albon with a maximum of 48 on offer in Abu Dhabi when pole position and fastest lap bonus points are factored in. WATCH: @GeorgeRussell63 takes a big step towards the F2 title with victory in Russia! Lando Norris is now mathematically out of the title fight after a nightmare weekend in Sochi ended in another retirement. There was drama before the race even started as Norris struggled to get away on the formation lap and then picked up a 10-second stop/go penalty for being out of position at the safety car line. When the race got underway there were cars everywhere at the start, with several drivers off the road at Turn Two. A couple of corners later Alessio Lorandi ran into the back of Nicholas Latifi causing a Safety Car. When the order settled, Nirei Fukuzumi, who had started from reverse grid pole, was still in the lead, but he was quickly hunted down by Russell who took the lead on lap five. From there, the Mercedes junior driver drove a brilliantly-controlled race to take victory - even when the rain arrived at the midpoint of the race. After a couple of difficult laps on slicks, most of the field pitted for wets on lap 13, but Charouz left both their drivers out gambling on the track drying. While they briefly led, it backfired as both Antonio Fuoco and Louis Deletraz finishing out of the points. Late in the race Norris' misery was compounded when Arjun Maini tagged the right-rear tyre on the British driver's Carlin causing a puncture and putting him out of the race. 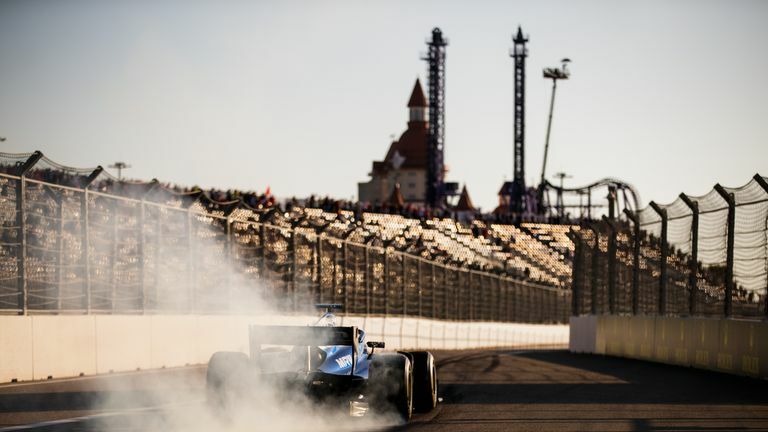 It was a better day for the sister-Carlin of Sergio Sette Camara, however, who finished second, with DAMS Alexander Albon completing the podium. The F2 championship concludes in Abu Dhabi on November 23-25.